How Great is a Tanning Bed? Growing up on the Jersey Shore, it’s a given that I love going to the beach. The beach had so much to offer, from body surfing in the ocean to reading a book in the hot sand to tanning. Spending my whole summer at the beach, obviously I love to fry up and get a little color. I love when you can see the tan lines of your bathing suit and the freckles on your nose start to pop out. However, when the summer ends so does your tan. No more tan lines showing which bathing suit you were wearing that day and no more freckles on your face. The weather soon changes and instead of wearing bathing suits we are wearing heavy jackets. Soon enough the post-depression of summer ends, but it was not until a friend had mentioned that she still goes tanning even in the winter. She explained and even brought me to a tanning salon where she says she visits quite frequently so she doesn’t lose that summer glow. I thought what a great idea in order to stay tan, but are tanning beds actually safe for us? There are two possible hypothesis before researching more into the topic. The Null Hypothesis being that nothing bad for your health happens when you use a tanning bed, while the Alternative Hypothesis would be something bad for your happens when you use a tanning bed. According to the Center for Disease Control and Prevention, tanning beds use two different types of UV rays, UVB, which helps build melanin, and UVA, which helps turn that melanin into a bronze. Each time you decide to use a tanning bed, you increase your chances of getting melanoma, the most dangerous skin disease. So, is there a difference between tanning in a bed or tanning outside? According to the Center for Disease Control and Prevention, tanning in a bed is more dangerous. Although you are only receiving a tan for a short period of time, the UV rays you are being exposed to are at higher levels than the sun outside. Since the Alternative Hypothesis that tanning beds cause something bad for you was true, I thought I’d take it a step further to prove how bad tanning beds really can be for you. A study by Bonial and other collegues was determined to discover if tanning beds were linked with melanoma. This meta-analysis was based on 27 different studies in order to determine a conclusion. Throughout the study it was noted that after each use of a tanning bed one had a 1.8% increase of receiving the cancer. Other data showed that in 3,438 cases of melanoma were linked to people using tanning beds. The conclusion of this study proved that tanning beds do indeed increases one’s chances of getting melanoma. The data alone shows that by using a tanning bed, your chances of getting cancer increases with each use. Although my friend decided to use a tanning bed, I believe it is safer not to use one. I rather just wait until summer to lay on the beach and get a healthy tan! This entry was posted in Uncategorized on October 17, 2016 by Gulianna E Garry. AH! I can totally relate to this post because back in high school for prom and different school dances my friends and I would pay for months of tanning beforehand! I hated the feeling of being “pale,” and I feel like many others can relate to this!! The show “True Life,” from MTV actually filmed a mini documentary about a girl who was obsessed with tanning in my hometown Monroe, Connecticut. I believed the episode about the girl displayed that tanning also had a mental aspect to it. She became obsessed with it and would spend about $300 a month just for tanning. She claimed how it made her feel better and she could not stop. She loved the “feeling,” of it. I’m from Manhattan Beach, California, so I can relate to living on the beach all summer! My tan lines are unreal and they are currently gone and I am so bummed. My roommate goes to the tanning beds here at school, but I told her I wouldn’t because my mom has always told me not to. I decided to read your blog and see if my mom is right, and it turns out she is. It’s scary to think of all these young girls going to the tanning beds almost once a week, increasing their chances of melanoma every time. I am going to share your blog with my roommate and see if she will decide to stop going! I found this article as a little motivation for her to stop going to http://www.cbsnews.com/news/woman-posts-skin-cancer-selfie-to-warn-about-dangers-of-tanning/. This topic i’m sure is very prevalent in todays society. Tanning salons seem to have grown in popularity in time. Even my apartment complex offers free tanning in tanning beds! Although tanning beds seem to be dangerous I wish you would have talked about other alternatives like spray tans. If you’d like to look into it I found an article on Livestrong’s website that has a list of pros and cons of spray tanning. I think it would be worth your while to take a look! I am also from the Jersey Shore and devote every summer to becoming the tannest tan I can be. As someone who values being tan so much I personally would never use a tanning bed because the health risks seem obvious. When you are tanning at the beach you are using sunscreen and reapplying every so often. 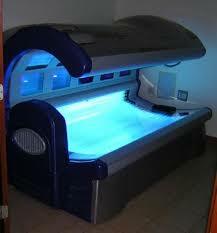 In a tanning bed you are enclosed in a bed of UV lights with no sunscreen that you can reapply. Would you ever tan outside right underneath the sun (if it was possible to survive under the sun)? Your answer should hopefully be no! Skin cancer runs in my family so I will never resort to using a tanning bed for increased skin problems. The way I stay tan in the winter months is by getting organic spray tans. You should give it a try. I agree that tanning beds can be very dangerous and the costs associated with the far outweigh the benefits. Despite this, people still decide to use tanning beds. People have given a lot of credit over the years to tanning beds being ‘cancer causing’ machines, leading people to rather tan naturally. But tanning naturally can be just as dangerous. Even on a cloudy day, the sun can emit powerful UV rays that are very harmful to the skin. This is why taking care of your skin is a huge deal and not many people realize what they should be doing. Sun screen is something that should be used at all times while outside during summer months. This article mentions just 5 of the major benefits to wearing sunscreen. I summer in Stone Harbor, New Jersey so I know what you are saying but I also have never used a tanning bed. The only thought I have about the two ways of tanning is that one is controllable–and one isn’t. I spent some time in Hawaii when I was probably 11 or 12, and I promised my mom I could be trusted with the sunscreen and all would be well. Turns out that falling asleep on the beach and lying to your mom is an awful thing for your skin, and I had water blisters covering my left arm for a few days. It was some of the worst pain I have ever felt and will probably create a lasting weakness to sunlight in my skin. I didn’t realize how terrible the effects of the sun could be when precautions are almost entirely neglected. I’m just thinking that maybe in a larger scale the sun itself is doing more damage because there is absolutely no control over it, only preparation. Tanning beds can be measured and accounted for while the presence of the sun is something no one can alter or adjust for their body or time in the light. What do you think about this? I wonder how many people who have access to both at the same time choose the tanning beds.